This article provides in-depth fundamental analysis of Finolex Cables Ltd, a manufacturer of cables, fans, switches etc. The company specializes in electrical, power distribution and communication optical fiber cables. Established in 1956, FCL is the flagship company of the Finolex group, and among India’s leading electrical cable manufacturers. FCL has a large product portfolio, which encompasses electrical, communication, and power distribution cables. The company also has a presence in the electrical switches, compact fluorescent lamps and LED businesses, and the recently launched Fans, MCB’s and Water Heaters. Its products find application across the residential, commercial, infrastructure, and industrial sectors. FCL has manufacturing locations in Maharashtra, Goa, and Uttarakhand. In January 2008, FCL and JPS entered into a JV to form FJPS, to manufacture high-voltage (up to 500 kilovolts) cross-linked polyethylene insulated power cables, used in power distribution. FJPS also offers turnkey solutions for extra-high voltage cable systems. FCL formed a JV with Corning in 2011-12 to market optical fiber to cable makers in India. Finolex Cables (Fincable) is increasing sales at an average rate of 6% over last 10 year, although growth has dropped to an average of 1.2% over last 3 years. This drop is mainly due to a decrease in input material price (largely copper) over last 3 years, although the company is continuously increasing in volumes terms. SSGR (Self Sustainable Growth Rate) is continuously increasing and now at 35%, which gives Finolex Cables margin of safety to grow at much higher rate using internal accruals and do not rely on debt funding to fuel growth. The company is also continuously decreasing its debt from Rs 287 Cr. in 2008 to Rs 0.75 Cr. in 2017. OPM for Fincable is dependent upon copper price and largely take one quarter to stabilize after a strong move in copper price, which can be seen, from the graph above for last ten quarters. OPM for finolex cables is increasing continuously from 6.8% in 2011 to 15.2% in 2017. This improvement is largely attributable to softening of copper prices and was supported by high plant utility. Among the publically available documents, there is no clear mention of total plant capacity established by Fincable, but we can derive supporting inference from the fixed assets data. In 2009 total fixed assets was Rs 415 Cr. and in 2017, total fixed assets are Rs 415 Cr. Looking at the tax payout ratio we can notice that the tax payout for Finolex is around 24%-25% range which is below India’s standard payout of 30%-33. This is due to the tax benefit company enjoying in Roorkee facility. As per Management overview for FY11, the company has 30% tax benefits in profit generated from Roorkee plant. This tax exemption will be over in FY19. Looking at the working capital management of the company, the sum of CFO (cash flow from operations) for last 10 years stands at Rs 1768 Cr and sum of net profit reported by the company for last 10 year is 1412.42 Cr, which is less than the sum of CFO. This shows company’s profit is not stuck in receivables and inventories and is available to the company as cash flow to fund growth and repay debts. The total sum of capex for the last 10 years stands at Rs 464 Cr, which gives the company free cash flow of around Rs 1304 Cr. The company has used this used this free cash flow to reduce its debts from Rs 288 Cr. in the year 2008 to Rs 0.75 Cr. in 2017. The company has also paid a total dividend of around Rs 220 Cr. in the last 10 years. After deducting dividend and debt repayment, the company has enough cash flow to fund expansion plans from internal accruals. ROTC is continuously increasing for the company from 6% in 2010 to 17% in 2017; also, NFAT has increased in the same period from 3.88 to 5.77. This increase in both the parameters is largely attributable to improvement in OP margins because of decreasing copper prices and higher utility of plants. Receivable days and inventory days are more or less stable in a small range, signaling good working capital management form the management over the years. 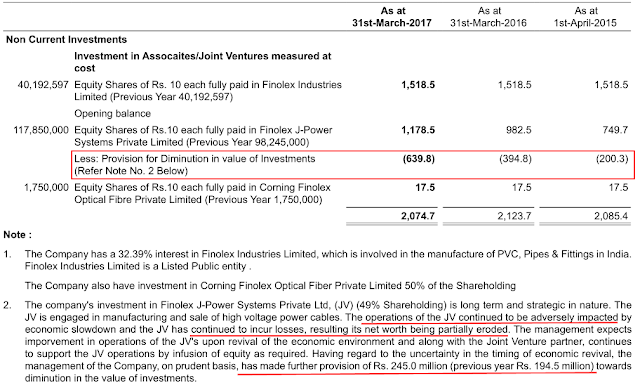 Looking at the joint ventures of the company, Finolex cable has two joints ventures at present, Finolex J-Power Systems Ltd (49% holding of finolex cables) and Corning Finolex Optic Fibre Pvt Ltd (50% holding of Finolex Cables). Finolex-J power started operations in 2008 and still a loss-making venture. The company is continuously infusing new capital into the company to keep it running with the hope that it will turn out to be a good business in long run. The shareholder should be cautious about the optimism of the management on joint venture as after 6 years company is still loss-making. The second joint venture Corning Finolex Optic Fiber started operations in 2011 and only reached to breakeven level last in 2016. However, the company was optimistic that the venture will generate profit going forward but in 2017, also the venture remained at a breakeven level. The company also has 32% interest in finolex industries, which manufactures PVC pipes and PVC resins. The company has investments in direct equity of around Rs 95 Cr. which include direct equity in IndusInd Bank (around 50 Cr) and Bharat Forge (3 Cr.). The profit and loss in this account are calculated in other comprehensive income. In addition, the company has an investment of around 600 Cr. in debt instruments. Profit and loss on this investment are included in P&L statement as other income. The investment in debt instrument can be considered safe and can be used as cash in case of new capex requirement. 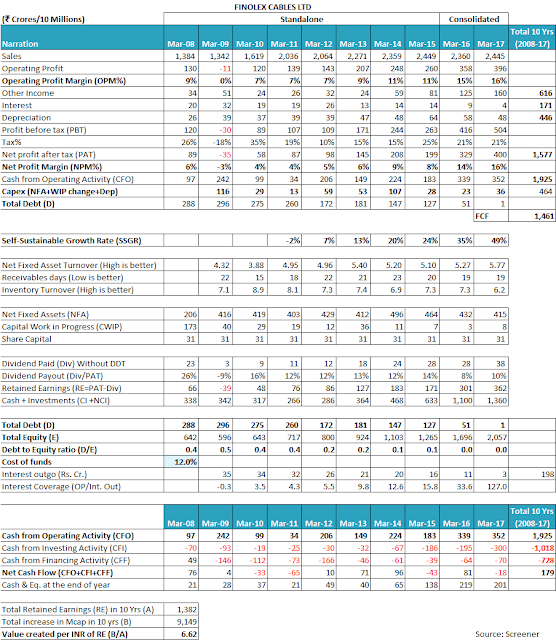 Fund flow analysis provides a better picture of which part of the company’s balance sheet the cash generated by the company over the years are going. This provides a picture of whether the company is growing its balance sheet on account of increased shareholder equity or on account of liabilities. We can see that the liability side of the company’s balance sheet is increasing on account of shareholder equity over the years. In FY17 Company’s assets side largely increased on account of increased inventory and increment in current investment. Looking at the annual reports current investment include liquid debt instrument, which can be considered as a safe investment. Domestic sales contribute around 99% of the total sales of finolex cables. Apart from that, only 9% of the total raw material consumed is imported. Segment-wise sales distribution is shown in the table below. Finolex cables is the leading electrical cable manufacturer in India, with the widest range of products. Electrical cables contributed about 82% of total sales in FY17. Communication cables are the fasted growing segment for Finolex Cable. The company has a wide range of products to cater all kinds of customers. The recently started segment of fans and switches are getting traction but still at a very nascent stage and contribute very little to sales. This section has not reached to PAT positive state yet. Havells, V-guard, Kei Industries, Universal cables, unorganized sector etc. Sterlite techno, Apar industries, unorganized sector, etc. Comparing finolex cables with peer companies, we can see that Finolex cable is only second to Havells in terms of total sales. 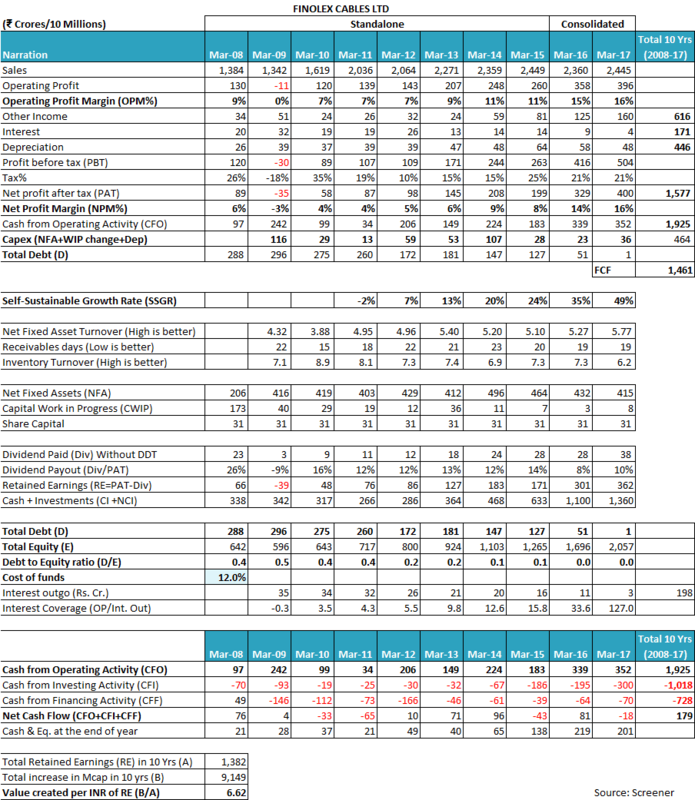 In margin front company is performing better than its peers in terms of operating margins and net profit margins even though the company like Havells and V-guard manufactures white goods like fans and invertors which have better margins than cables. ROTC of finolex is less compared to its peers largely because of already installed excess manufacturing facilities. As company’s volume increase, we can safely assume that the company’s ROTC will also improve in the future. In shareholding pattern higher promoter holding signify higher confidence of promoters in the company and considered positive. Higher institution holding and lower retail holding is considered positive for the company as institution money is considered as smart money and stable money. 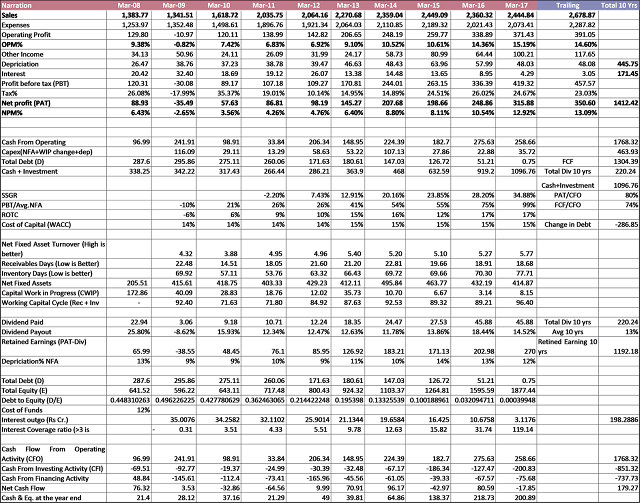 In case of Finolex, cable promoter holding is only 37.33%, which is less than desirable. However, looking into the retail holding details we find that out of 36.11%, 15.1% holding is from Finolex industries, which is also a Finolex group company. This makes total promoter holding of finolex Cable 52.43% that is higher than the desirable figure of 50%. We can also observe that the institution holding is slowly increasing in the company over the last few quarters, which is a good sign for the individual investor. The credit rating for Finolex Cables’s debt instrument is done by Crisil. Crisil has given the company CRISIL AA+ rating for long-term instruments which is only one point below the highest rating CRISIL AAA given by the company. 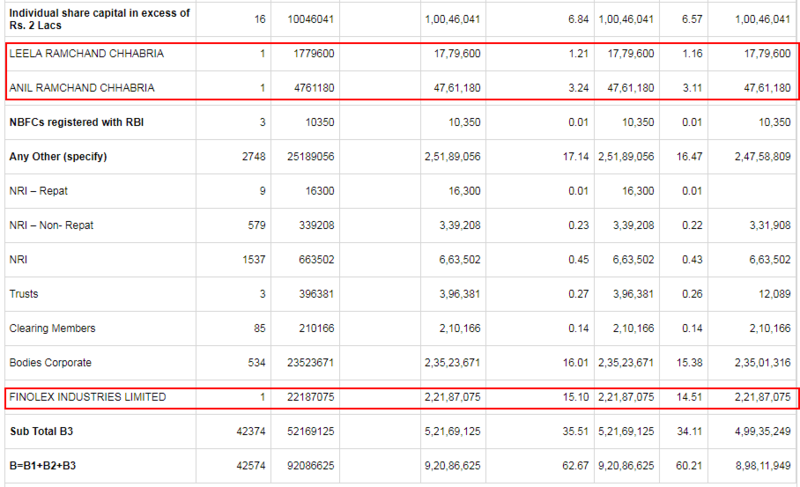 For the short-term instruments, crisil has given CRISIL A1+ which is the highest rating given by the agency. According to the crisil, the key strengths of the company are good brand recognition, healthy growth prospects of core business and healthy financial risk (Rs 2000 Cr. cash and cash equivalent, Rs 600Cr in debt instrument). Major weakness includes the vulnerability of the company’s margins to fluctuations in copper price and exposure to intense competition from unorganized sector. Rs.3.0000 per share (150%) Dividend. Generally, a growing company with good cash flow increases its dividend to shareholders on a year-to-year basis. 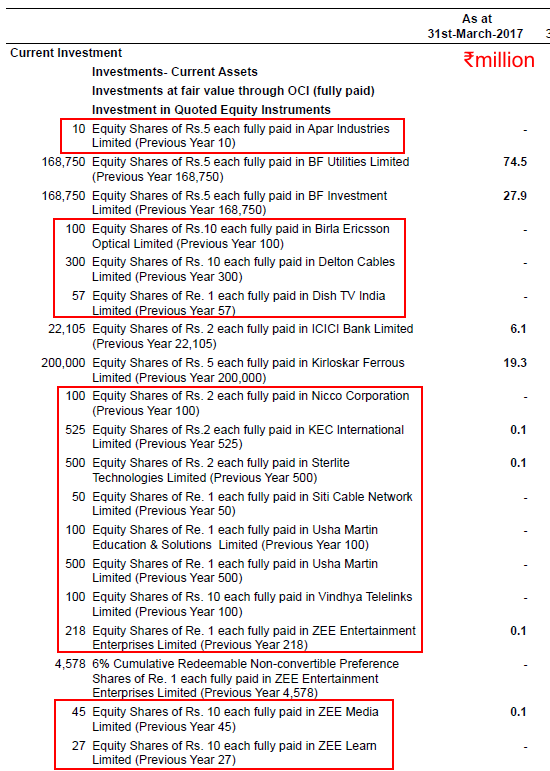 Finolex is increasing its dividend paid to the shareholders since last few years. The company is also reducing its debt at the same time. Therefore, we can safely assume that these divided are paid from internal accruals and not from debt. Key Management personnels of the company include Mr. D.K. Chhabria (Executive Chairman), the son of Mr. K.P. Chhabria (founder and former chairman of finolex cables) and Mr. Mahesh Viswanathan (Executive director and CFO). Deepak Chhabria joined Finolex cables as Dy. Production Manager in 1986. He was actively involved in setting up nine different manufacturing plants across four locations in India. He holds Bachelor of Science in Engineering Management from University of Evansville Indiana USA. Involvement of Deepak Chhabria in various projects shows that the management is sufficiently experienced and capable of executing new projects. Looking at the remuneration of key management personnel over the years we find that the remuneration is largely in the range of 3%-4% of net profit, which is well below the allowable limit of 10% of net profit. Related party transactions conducted by the company over the year are with only associate and subsidiary companies already mentioned in the annual report. No individual or privately owned company not mentioned in other parts of the annual report is involved in related party transactions. This practice provides confidence in management’s fair dealing. Company’s board consists of 10 members. Out of 10 members six independent, two executive directors and two nonexecutive directors, which is in accordance with the SEBI guidelines. Also, the company has M/s Ernst and Young LLP one of the reputed audit firms as the internal auditor. Volume growth of electrical cable segment, which constitutes the 82% of total revenue for the company, is very slow. The volume has increased 50445 MT in FY13 to 59812 MT in FY17. Profitability of Finolex J-Power Systems Ltd is a big worry and raise a question mark on management capabilities. In FY 15, management has guided in the annual report that the joint venture will turn profitable in the second half of FY 16 but joint venture is still loss-making. In FY 17, management has again guided that the joint venture will take another 18-20 months to turn profitable. Investors should keep a keen eye on this development in the future. Roorkee Plant tax benefit will be over in FY19 and will have effect in company’s PAT. 400 KV extra high voltage cable is under final stages of testing and is expected to get clearance by Dec ’17. Communication of the company with shareholders is low as the company holds no conference calls or investor meets. Thanks for sharing the analysis of Finolex Cables Ltd with us! We appreciate the time & effort put in by you in the analysis. The hard work put in by you in terms of reading past annual reports, credit rating reports, as well as analysis of different peers of the company, is visible in your report. 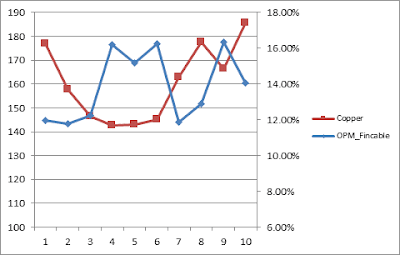 Your analysis would prove to be very helpful to any investor looking to analyse Finolex Cables Ltd.
Let us first try to analyse the financial performance of Finolex Cables Ltd over last 10 years. The company has been publishing standalone financials until FY2015 and from FY2016 onwards, the company has started publishing consolidated financials as well. We believe that while analysing any company, an investor should always look at the company as a whole. Therefore, she should focus on financials, which represent the business picture of the entire group including operations and assets. As a result, while analysing the past financial performance of the company, we have analysed standalone financials for FY2008-15 and consolidated financials from FY2016 and FY2017. Finolex Cables Ltd has been growing its sales at a moderate pace of 5-7% over last 10 years (FY2008-17). An investor would notice that the sales growth of the company has been associated with constantly improving operating profit margins (OPM). OPM of the company has improved from 7% in FY2010 to 16% in FY2017. There has been one exceptional year in the last year, the year of FY2009, when the company reported operating losses. A comparative analysis of the breakup of the expenses of the company in the year FY2009 and FY2017 will highlight those aspects of the business, which are focused upon by the management and resulted in the marked improvement in the profitability. An investor would notice that over FY2009-17, Finolex Cables Ltd has witnessed significant reductions in the areas of raw material costs and other expenses. Raw material costs as a percentage of sales have declined from 77% in FY2009 to 71% in FY2017, leading to an improvement of 6% in the OPM. Similarly, other expenses as a percentage of sales have declined from 9% in FY2009 to 1% in FY2017, leading to an increase of 8% in the OPM. These two parameters, raw material costs and other expenses, have contributed 14% out of the total improvement of 17% in the OPM of the company from FY2009 to FY2017. The decline in raw material costs as a percentage of sales highlights the increasing pricing power in the hands of the company over its customers. As a result, the company is able to pass on the changes in the raw material costs and additionally, steadily improve its pricing in a manner that it is able to increase its profit margin. The ability to protect & improve the profit margins by passing on the raw material costs to customers shows the strength of the business model of any company. The significant decline in the other expenses as a percentage of sales of the company requires further analysis by investors. 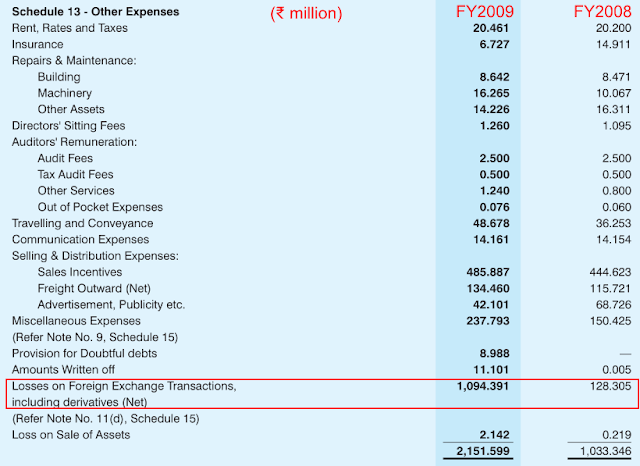 While analysing FY2009 annual report for the company, page 42, an investor notices that the company has disclosed losses on foreign exchange transactions and derivatives of about ₹109 cr, which have increased significantly from the losses of about ₹13 cr. in FY2008. The management has communicated to the shareholders in The Directors’ Report section of the FY2009 annual report, page 2 that these losses have resulted from derivatives due to adverse movement of currency and interest rates. These losses in derivatives have been one of the key reasons leading to operating losses reported by the company in FY2009. Moreover, upon analysis of annual reports from FY2008 onwards, the investor would realize that the company has recognized losses exceeding ₹250 cr. because of the derivative contracts from FY2008. The settlement of the losses on derivatives contracts from FY2014 onwards has led to improvement in the profit margins for the company. An investor would take note that derivatives are a double-edged sword and unless any person including individual investors as well as companies is proficient in dealing with them, derivatives can lead to significant losses. Finolex Cables Ltd had entered into these derivatives contracts to reduce its risks but apparently, the contracts could not protect it from adverse movements in the currency and interest rates. It is a lesson for individuals as well as corporates. In the comparative analysis of the breakup of the expenses from FY2009 to FY2017, the investor would notice that other components like Selling & Admin Costs and Other Manufacturing Expenses have also contributed about 2% each to the operating profit margin. The reduction of these costs with increasing sales is a result of operating leverage, which results in lower per unit costs as the expenses are spread across a higher volume of final product. An investor would notice that the net profit margin (NPM) of the company has witnessed similar improvement like the operating profit margin, which usually happens in companies where interest costs and the depreciation expenses are under control. As Finolex Cables Ltd has been able to keep its debt levels under check, therefore, the benefits of business operations seem to have reached the equity shareholders as well. Investors would note that in cases where companies undertake large debt-funded capacity expansion plans, the increase in sales is associated with increased interest expense. As a result, interest expense consumes the benefits of business operations (operating profit) and therefore, the improved operations many times benefit the lenders and not the equity shareholders. The tax payout ratio of Finolex Cables Ltd has been below the standard corporate tax rate applicable in India. It seems to be a result of the manufacturing plant of the company located in Roorkee, Uttarakhand. The management has communicated in its FY2011 annual report, page 33 that the Roorkee plant has income tax exemptions for 7 years. As the income tax benefits applicable to the Roorkee plant are about to end in coming years, therefore, an investor should expect the tax payout ratio of the company to increase in future unless the company is able to get extended benefits on Roorkee or any of its present/future plants. While analysing the net fixed asset turnover (NFAT) of the company over the year, an investor would notice that the NFAT has improved from 3.88 in FY2009 to 5.77 in FY2017. An improvement in the NFAT indicates that the company is able to operate more efficiently and is able to generate a higher amount of sales from its assets. 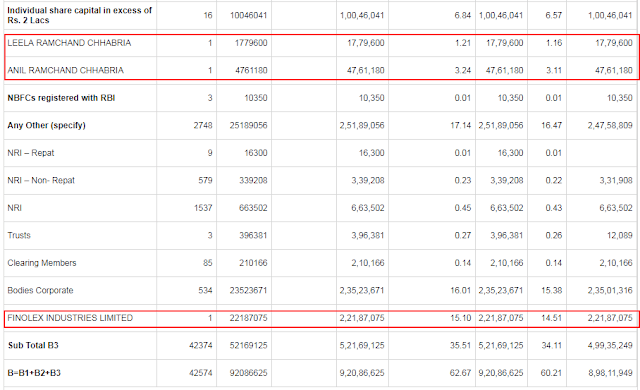 Looking at both the inventory turnover ratio (ITR) as well as receivables days of Finolex Cables Ltd, an investor would notice that the company has been able to keep both its inventory as well as receivables levels under check. Over the years, the inventory turnover ratio of the company has been within the range of 6.2 to 7.5 and the receivables days have been within the range of 19-22 days. Stable inventory and receivables position indicates efficient working capital management. As a result, working capital has not put the unnecessary financial burden on the company and it has been able to convert its profits after tax into cash flow from operations. The company reported a cumulative net profit after tax (cPAT) of ₹1,577 cr. over last 10 years (FY2008-17) and a cumulative cash flow from operations (cCFO) of ₹1,925 cr over the same period indicating good working capital management. An investor would notice that Finolex Cables Ltd has witnessed an SSGR ranging from 25-35% over the years. Conversely, if any company is attempting to grow its sales at a rate higher than its SSGR and additionally, it is not able to convert its profits into cash flow from operations, then its internal resources would not be sufficient to fund its growth aspirations. As a result, the company would have to rely on additional sources of funds like debt or equity dilution to meet the cash requirements to generate its target growth. An investor would notice that the SSGR of the Finolex Cables Ltd is about 25-35% whereas it has been growing its sales at a growth rate of 5-7% over the years. As a result, the company is able to meet its funding requirements from it business operations and has not required any financing from additional sources like debt or equity dilution. The company could meet all its capex requirements from its own business operations and generate surplus cash that it could repay almost all of its debt over last 10 year (FY2008-17) and has turn debt-free now. An investor is able to observe this aspect of the company’s business when she analyses the cumulative cash flow position of the company over last 10 years (FY2008-17). Over FY2008-17, the company increased its sales from ₹1,384 cr. in FY2008 to ₹2,445 cr. in FY2017 by doing a capital expenditure (capex) of ₹464 cr. Over the same period, the company generated a cash flow from operation of ₹1,925 cr. The company could meet its entire capex requirements from its CFO and had a free cash flow (FCF) of ₹1,461 cr. The company used its FCF of ₹1,461 cr. to repay its debt, pay the interest on the debt, pay dividends and it could still increase its cash & investments by about ₹1,000 cr. over last 10 years from ₹338 cr. in FY2008 to ₹1,360 cr. in FY2017. It seems that the markets have recognized these aspects of the company and as a result, markets have rewarded the company and its shareholders by giving a valuation of ₹6.62 for every ₹1 of retained earnings. Over last 10 years, the company has retained earnings of about ₹1,382 cr. and has witnessed an increase in market capitalization of about ₹9,149 cr. Two brothers founded Finolex Cables Ltd: Mr. P.P. Chhabria and Mr. K.P. Chhabria. In FY2013, D.K. Chhabria who is the son of Mr. K.P Chhabria took over as Executive Chairman of the company. This step of management succession seems to have taken place smoothly for the company. Mr. D.K. Chhabria is currently about 55 years of age. As per the annual report of the company for FY2017, there does not seem any other member of Chhabria family on the senior management/board positions in the company. We believe that investors should get clarification from the company about its promoter/management succession planning. Details of succession planning in terms of any member of the promoter family or increased role of professionals in the company are essential details for long-term investors in the company. As per BSE classification, at December 31, 2017, the promoters own 37.33% stake in the company. An investor would notice that Finolex Industries Ltd owns 15.10% shares of the company. Finolex Industries Ltd is a publically listed group company of the promoters where Chhabria family exercises significant control. 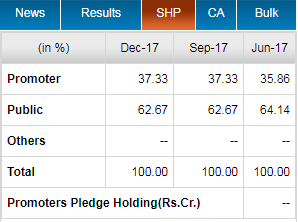 There is a high probability that the promoters Finolex Cables Ltd will be able to get Finolex Industries Ltd vote in their favour in board meetings. The combined stake of promoters and Finolex Industries Ltd is 52.43% in Finolex Cables Ltd, which provides them operational control of the company. Moreover, an investor would notice that Leela Ramchand Chhabria and Anil Ramchand Chhabria own 4.45%. It might be a possibility that they are part of friends and relatives of the promoters who are not classified as promoters according to the statutory guidelines. An investor may seek further clarification on their relationship with the promoter family to deepen her understanding. As per the recent shareholding announcements, the promoters have been increasing their stake in the company, which seems a positive development. 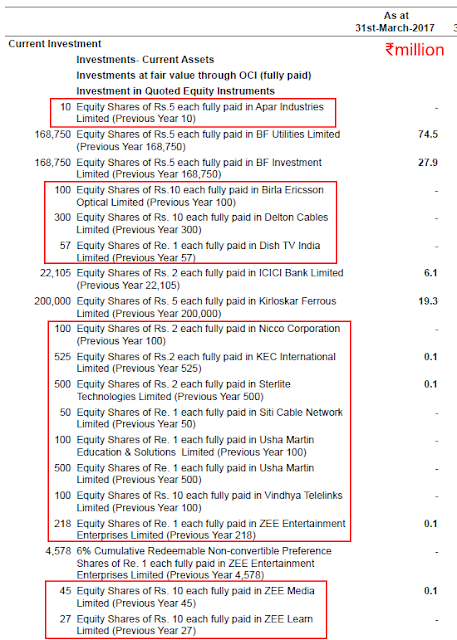 An analysis of the FY2017 annual report of the company indicates that it holds equity shares of about 20 publically listed companies excluding the shares of Finolex Industries Ltd.
Investments in about 18 other stocks are classified as current investments indicating that the company plans to hold them for a period of less than next 12 months. The total investment size of many stock positions is ₹ 1 lac or less, which his very low considering total cash & investments size of ₹1,360 cr. held by the company at March 31, 2017. An investor may interpret that the team in charge of the equity portfolio of the company is dealing in many small equity holdings with a speculative approach of holding them for a short period of less than one year. Moreover, it is preferable that the company should focus on its primary activity of manufacturing cables/electronic goods etc. and not divert resources towards speculations in the equity markets, which is not a core strength of the company. In case, the company is not able to find appropriate use of the funds in terms of investments in the core business, then it may return the funds to equity shareholders by way of dividends or share buybacks. The company lost a lot of money (more than ₹250 cr.) 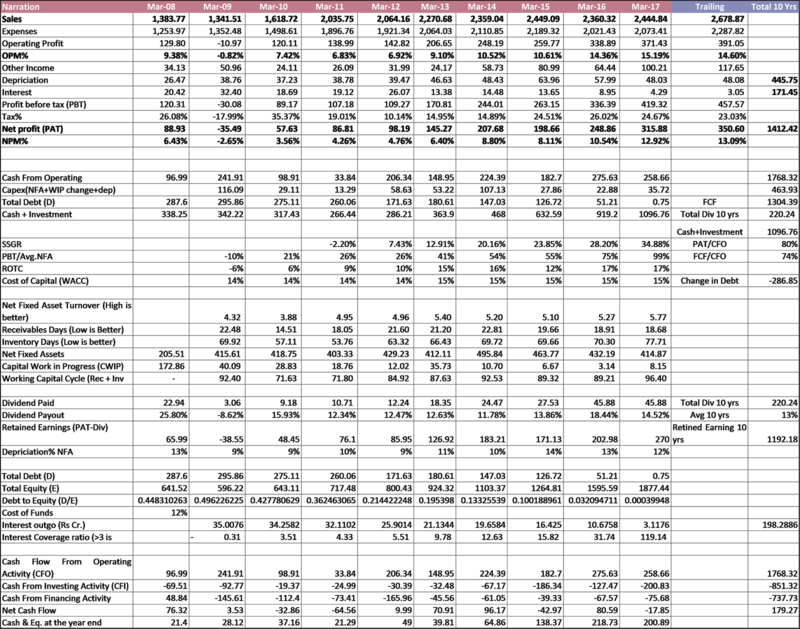 when it entered into derivatives contracts in the past. 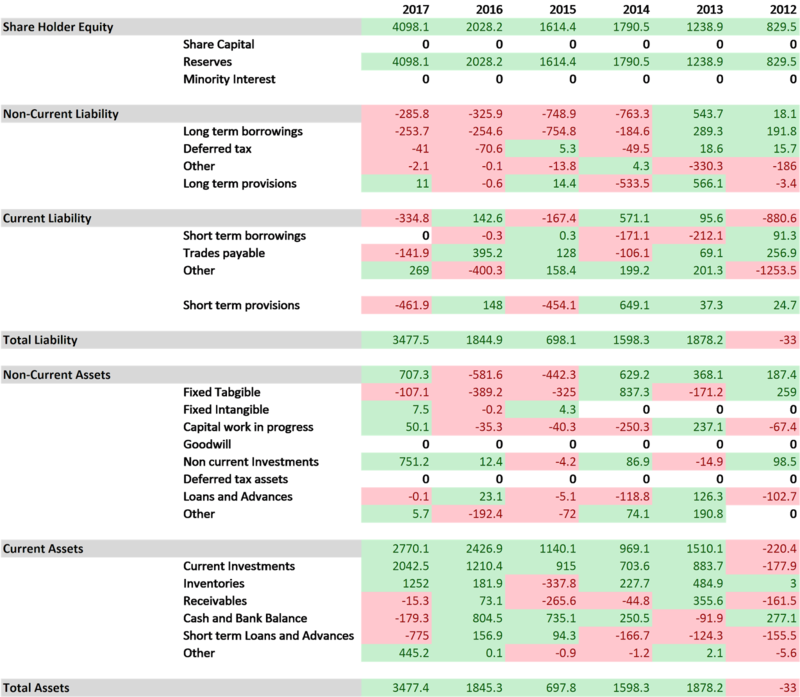 Derivatives are not the core area of strength for the company. Similarly, it is preferable that the company should find investment opportunities in its primary activity of manufacturing and not take speculative positions in equity markets. As analysed above, Finolex Cables Ltd has been generating a lot of cash from its core business of cables manufacturing. As a result, the company has a significant position of cash & investments even after it has repaid almost all of its borrowings. Until now, these ventures have not led to any significant value addition for the equity shareholders of Finolex Cables Ltd. FJPS has been loss-making ever since its incorporation and as a result, Finolex Cables Ltd has to invest more & more capital to keep the company afloat. As highlighted by the company management, FJPS is facing very severe competition in tendering & other business aspects. Similarly, Corning Finolex Optic Fibre Pvt. 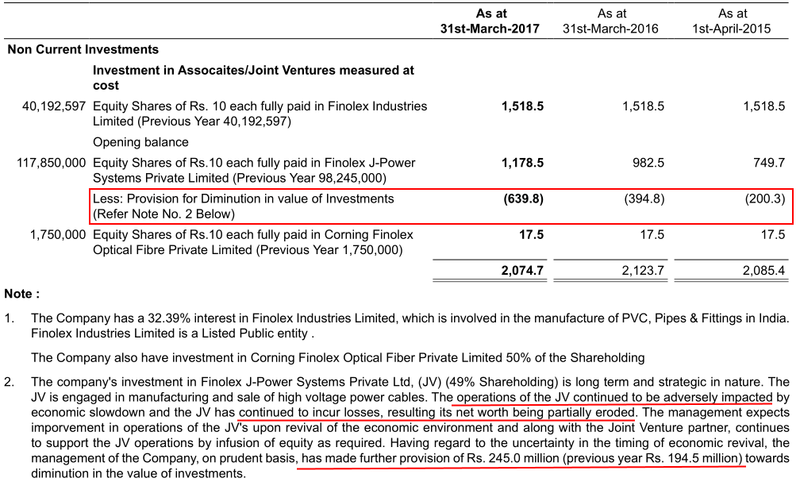 Ltd has also not led to any significant value addition to the shareholders of Finolex Cables Ltd.
As per FY2017 annual report of Finolex Cables Ltd, page 52, FJPS has contributed a loss of ₹12.4 cr. 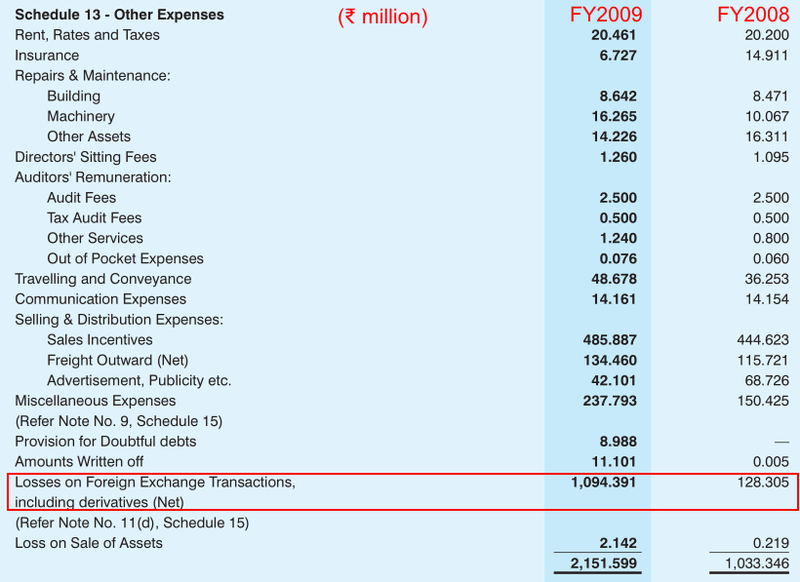 to the consolidated financials of the company and Corning Finolex Optic Fibre Pvt. Ltd has been a no-profit-no-loss position for the year. An investor needs to assess whether these ventures are a result of the trial & errors attempted by the management of Finolex Cables Ltd only because of availability of surplus funds with the company. An investor also needs to assess whether continued equity contribution to FJPS by the company is akin to throwing good money after bad. In FY217, Finolex Cables Ltd has witnessed a very sharp increase in its inventory levels. The sales for the company increased by about 4% in FY2017 whereas the inventory levels increased by about 40% during FY2017. Inventory levels increased from ₹329 cr. in FY2016 to ₹462 cr. in FY2017. An investor may seek further assessment of the inventory position including clarifications from the management regarding the sudden increase in inventory levels and whether any of the inventory faces the risk of becoming obsolete. Currently (February 9, 2018), Finolex Cables Ltd is available at a price to earnings (P/E) ratio of about 30 based on trailing 12 months standalone earnings, which does not offer any margin of safety in the purchase price as described by Benjamin Graham in his book The Intelligent Investor. Overall, Finolex Cables Ltd seems to be a company, which had been growing in a capital-intensive business at a moderate pace of 5-7% year on year. The company has been able to achieve the growth with remarkable improvement in the profit margins. The OPM of the company has improved from operating losses in FY2009 to an OPM of 17% in FY2017. The company has been able to pass on the increases in the raw material costs to its customers, pay off the losses on derivative contracts and use operating leverage to improve its profitability. 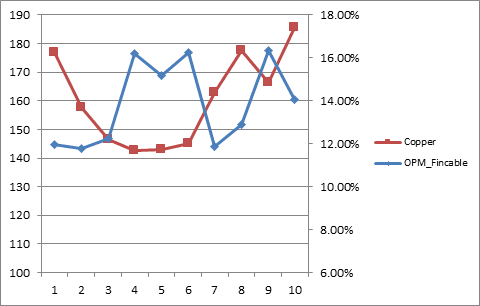 The company seems to have higher profitability than its peers because of backward integration. The company has shown good operating efficiency by maintaining its working capital efficiency and improving its fixed assets utilization. The company has been able to grow using its internal resources and simultaneously generate a lot of cash. As a result, it could repay almost its entire debt, pay dividends from its cash accruals, and create a significant cash position over the years. The management seems to be trying out different avenues to deploy the surplus funds in ventures like high voltage power cables, optical fiber production etc. However, until now, such ventures have not benefited the shareholders of the company despite quite a few years of operations. The company has been continuously putting additional investments into FJPS while simultaneously writing off its previous investments. It remains to be seen whether it proves to be a case of throwing good money after bad money. The company has a history of entering into exotic financial products where it burnt its fingers when certain derivatives contracts led to losses of more than ₹250 cr. post-2008. In recent year, the company seems to be taking small speculative positions in equity markets, which seems to be an area outside of its core expertise in cables manufacturing. The company witnessed a smooth transition of management from the founding generation to the next generation in FY2013. The current executive chairman is about 55 years of age. It remains to be seen whether the current promoter management plans to groom any member of the promoter family as next line of leadership or plan to hand over the reins to professionals. Going ahead, investors should monitor the operating profit margin to ascertain continued ability to pass on raw material costs and monitor the net profit margin to assess the increase in the tax payout ratio because of cessation of income tax benefits of Roorkee plant. Investors should get clarify from the management about the management succession planning, small speculative positions in the equity markets and sudden increase in the inventory levels recently. Investors should keep a close watch on the performance and additional investments by the company in its joint ventures. These are our views about Finolex Cables Ltd. However, investors should do their own analysis before taking any investment related decision about the company.